Every year around Thanksgiving, my kids come home with the same type of project. Sometimes it's a placemat, other times we've gotten a decorated poster complete with glitter and stickers and one year we even were blessed with a 3D diorama. The vehicle is always different, but the message is always the same — "What I'm Thankful For." When they were younger, the list was very basic. "My toys." "My mom." "The cat." Simple items that are the basic cornerstones of every preschooler's world. But as they got older, my kids started to get a bit more in-depth with their thoughts. "The world." "My friends." "That I'm healthy." What is it that makes a person thankful and why is it that we often only acknowledge our appreciation for what is important in our lives around the holidays? 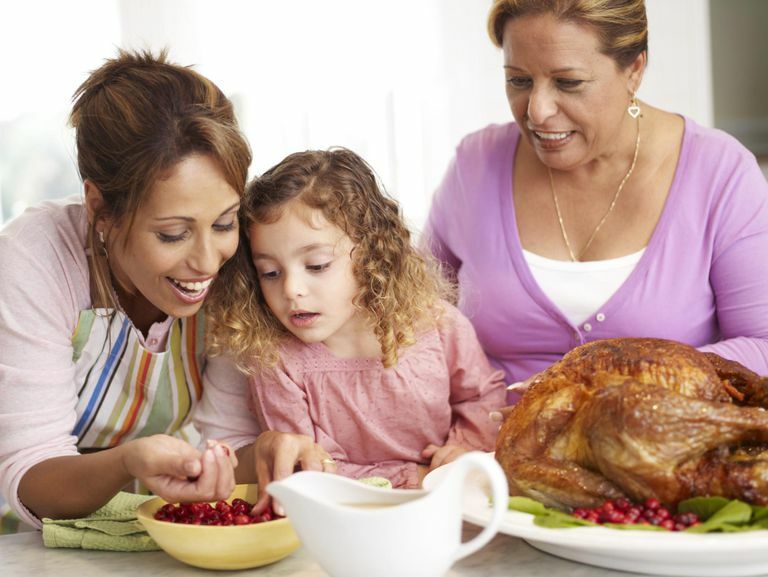 While it's true that we shouldn't only be thankful at the end of the year, it's actually a very good time to talk to your children about the concept and why it is so important. This is especially true with preschool-age children who often do best learning a new idea when it is modeled for them. So whether it is November or March, there are easy ways for you to demonstrate to your little one the notions of thankfulness, kindness, and generosity and why they are so important. Set a good example. You are your child's first and best role model. If she sees you engaging in the generous behavior, she'll want to do the same thing. So if you are buying food for a local food drive or donating clothing to a church, let your preschooler know what you are doing and why. You aren't showing off or patting yourself on the back, you are demonstrating generosity in action. Let her help. If her preschool is holding a toy drive, let her come with you to pick out the toy and wrap it. Explain why toys are being collected and why it is important that you help. Don't ask her to donate her own money, but if she volunteers, accept with great praise. If she has a lot of toys lying around that she no longer plays with that are in good shape, consider approaching her about donating them to a needy family or local preschool or daycare center. Put things in perspective. Naturally self-centered creatures, it's hard for preschoolers to grasp that there is a big world and it isn't orbiting around them. Do your best to explain that just like he does, people everywhere have different things that they need. Without being too heavy-handed, talk about how some people need warm food to eat and clothes to wear and how it is very nice when other people help out by buying these types of things. Start off small. By simply teaching your child to share or to better get along with a sibling, you are one step closer to raising a child who appreciates what he has. Learning to be considerate of others is a big lesson for a preschooler to learn and one that translates well into a bigger arena when he gets older. Praise and scold appropriately. When your child does perform an act of kindness, be effusive in your approval. Say things like, "I'm so proud of you for sharing the toys at preschool." More than anything else, your preschooler wants to make you happy, so when she does, shout it from the mountaintops. As she gets older, she'll still appreciate your support but will behave in a generous fashion because it makes her feel good. At the same time, if your preschooler behaves selfishly, be sure to let her know. "It makes me and your friend sad when you grab toys away. Why don't you take turns?" Stress the importance of manners. Thank you is such a simple phrase, but it makes such a difference in a little one's behavior and how he is perceived. At first, the words may just come out of your child's mouth out of force of habit or because you are prompting — "What do we say?" — but eventually, he'll grasp the meaning behind them. Talk about why telling someone "thank you" is important. Point out a time that someone said "thank you" to him and how that made him feel good inside. Get them to take stock. The projects that my kids do every year are actually a great idea. It makes them stop and think about the people and things that matter most to them and why. In the beginning, you might be concerned if your little one rattles off a list of all the toys and things that she owns, but even being thankful for material things is OK. Just be sure to help her balance the list out by pointing out the people in her lives that she loves too. As your little one develops characteristics like empathy and sympathy, so too will his sense of gratitude — attributes that will help make up his value system. Teaching a child to be thankful, generous and kind is a lifelong process and one that involves lots of friends and family to help — certainly something to be grateful for.